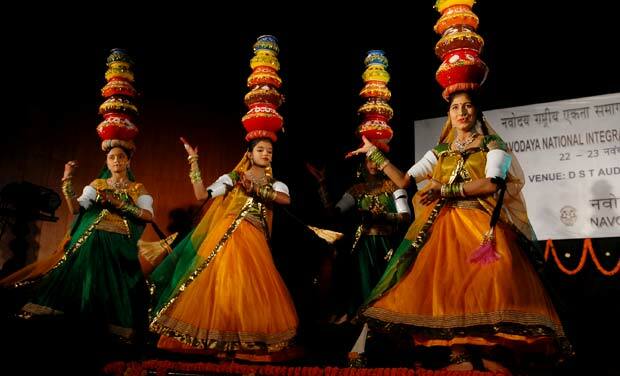 Folk dances of India: India is famous for its folk dances as well. The folk dances of India are world famous. Usually folk dance is performed to celebrate any rituals or festivals of that particular state and also birth of child, arrival of new season. It is done with joy and all the people of the village join together and enjoy the folk dances. There are many folk dances. It is difficult to describe each and everyone in my page. However I have tried to my best to make you understand the different folk dances of India in brief. Feel free to express more in your feedback at the bottom of the page. These dances are extremely simple and have no particular form or rules like that of classical dances. Each state has minimum of 2-3 folk dances. Most of the folk dances have lot of foot movement and various forms of drums are used for music. Usually the dancers sing the song in chorus. 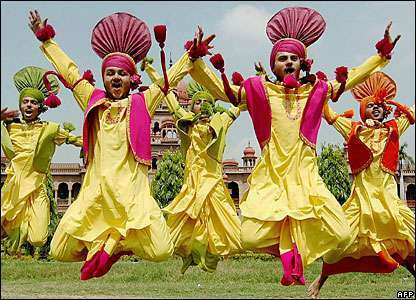 Bhangra: This is a famous folk dance performed in the state of Punjab. A very energetic and highly enthusiastic dance performed by men and women during the harvest festival called as Baisaki, which usually comes in the month of April. It can be said that no celebrations are complete without a Bhangra dance. Dumhal: This folk dance is performed by Rauf tribe in the state of Jammu and Kashmir. This dance is performed by men. The uniqueness of this dance is that a banner is kept on the ground and all dancers perform around the banner. Music is usually drums and the dancers sing in chorous while performing the dance. Rasa Lila: Ras lila is a famous folk dance performed in many parts of North India more prominent in the birth place of Lord Krishna (Mathura in Uttar Pradesh). This is a dance drama form which shows the love of Lord Krishna and Radha. It is assumed that this dance was performed by Lord Krishna with Radha along with Gopikas. This is a popular folk dance in Manipur as well. Yakshagana: It is a popular folk dance of Karnataka. It is famous in the districts of dakshina Kannada, Shimoga, Kasaragod, Udupi, Uttara Karnataka. It is a dance drama combination which runs from morning till dawn. Actually it can be said that Yakshagana is a mixture of dance, drama, dialogue, music and with heavy costume. It is done for the stories of Ramayana, Mahabharata. Veeragase: This is another rigorous and rapid folk dance which originated from Karnataka state. It is based on Hindu Mythology. It is performed during festivals and during the months of Shravana and Karthika. Other than the above two Karnataka has many other folk dances. Theyyam: It is a dance form that originated from Kerala state. This dance is performed mainly to please Goddess Kali. The dance is usually performed in front of whole village and there is no stage set for this dance. The dancers usually wear red dress and paint their face with red colour. The song usually describes the myths and legends of the deity. Theyyam is also called as Kalliyatam. Thidambu Nritham: It is a popular dance form of Kerala. It is a ritual dance performed in temples. Usually the dancers carry the replica of God on their head. Foot work is very important is this and 10 persons are required to perform this dance. The male dancers usually wear silk dhoti along with a silk cloth to cover part of the body. It is performed mainly by Namboothris Brahmins. Garadi: It is a popular dance form of Puducherry. It is believed that when Lord Rama defeated Ravana all the monkeys (Vanara’s) performed this dance to celebrate the victory. Even today the dancers are dressed like monkeys and perform the dance they also wear 10 anjali also known for iron rings to each legs. The dance is performed for 5-10 hours. This is performed on all festivals. Karakattam/Kargattam: It is a famous folk dance of Tamil Nadu. This dance is performed by villagers by keeping water pots on their heads to thank and praise the rain called as Mari Amman. The pots are decorated beautifully. This dance is of two types one is called as Aatta Karakam and the other is called as Shakti Karakam. Aatta Karakam is mainly done to entertain audience while Shakti Karakam is done purely in temples as a spiritual offering to Rain God. Kolattam: This is a popular folk dance in the state of Tamil Nadu. It can be said that Kolattam is similar to Dandiya from Gujarat. Even in these women dancers hold two sticks and do the dance. The dancers usually move in circular motion by hitting the sticks rhythmically for the song. Tappeta Gullu: This dance originated from the state of Andhra Pradesh. It is mainly performed in Srikakulam district of AP. The dance is done to praise the God in which 10 dancers do the dance. The dancers wear drums hanging around there neck. 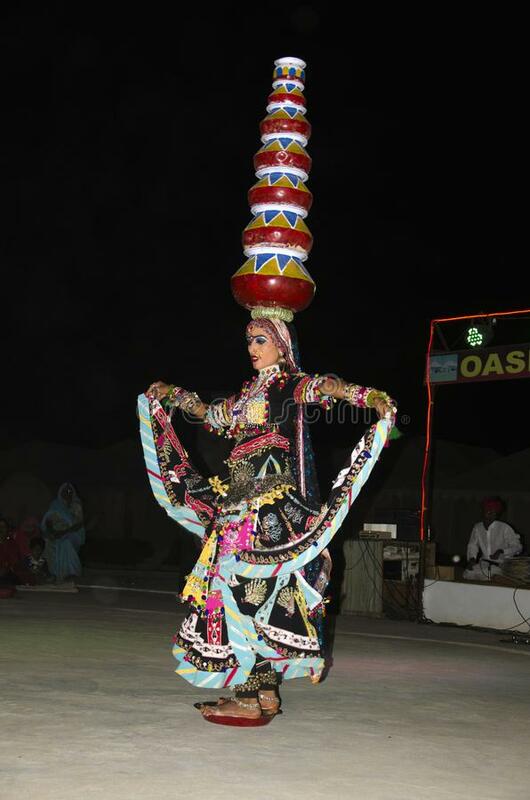 Garbha: This is a famous folk dance from the state of Gujarat. It is usually performed during the nine day navratra celebrations, which usually comes in the month of Sep/ Oct. Women wear colourful dress for the dance. It is maily dominated by women dancers and is performed to please Goddess in Navratras. It is performed is circular movement with rhythmic clapping of hands/ short wooden sticks. Fugdi: This is a traditional folk dance of Goa. This dance is performed in Konkan region. It is performed during the Ganesh Chaturthi festival by women. At the beginning the women dancers start with a slow pace but later they gain momentum and form circles and rows while singing themselves. Dandiya Raas: This folk dance originated from Gujarat. A highly enthusiastic and vibrant dance, dandiya is performed with colourful sticks in the hands of dancers. The dancers strike each other’s sticks in rhythmic and musical way to give a soothing noise to the ears. This dance is usually performed during Navratras or any other festivals in Gujarat. The instruments used for this dances include tabla, Meddale and drums. 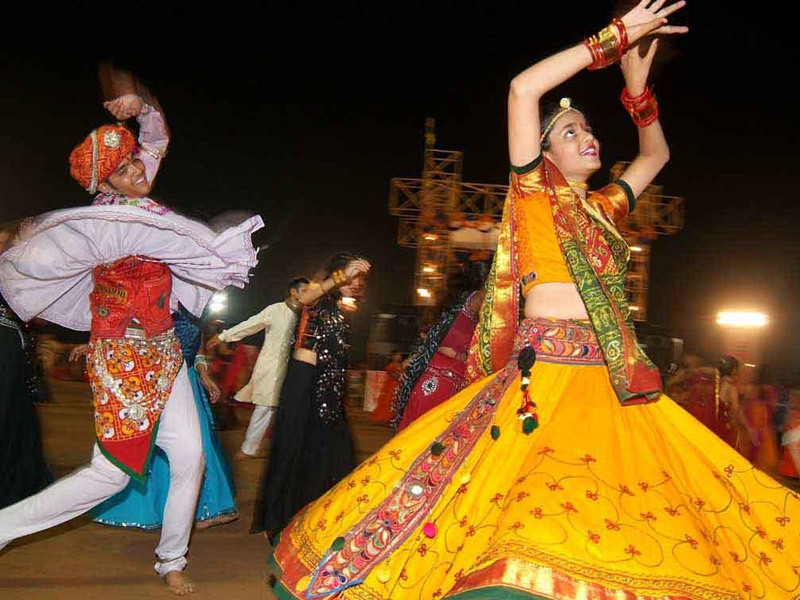 Ghoomar: Ghoomar folk dances originated from the state of Rajasthan. It is a very electrifying dance performed by Bhil tribe. This dance is performed to please Goddess Sarasvathi. The women dancers usually wear ghagara (long skirt) along with a duppata that covers their face. Ghoomar is performed during weddings or any festival or for any other happy occasion. Lavani: Lavani is the popular folk dance of state of Maharashtra. Lavani means beauty which is performed to the beats of Dolki. This dance has contributed a lot to the development of Maharashtra folk theatre. Lavani is a very colourful and vibrant dance. The women dancers who perform lavani wear nine yards saree and a bun on their head. Cheraw Dance: A wonderful folk dance of Mizoram is performed with two bamboo sticks. Four people hold two pairs of bamboo sticks which are kept in cross horizontal form on the ground. Male dancers move their feet rhythmically between the bamboo sticks. Bamboo sticks are supported with two bases, when they beat these sticks to the ground it produces rhythmic sound to which dancers perform the dance. It is also called as bamboo dance. The traditional costume worn by women dancers are Thina, Vakiria, Kawrchei and Puanchei. All these are costumes which come in vibrant colours. Bardo Chaam: This folk dance is performed in the state of Arunachal Pradesh by a small community known as Sherdukpens. This dance is performed to show the victory of good over evil. Bihu: It is a famous folk dance of Assam. It is performed during the festival of Bihu. Bihu festival is celebrated during the harvest festival. The women dancers usually wear traditional saree of Assam and men wear dhoti. The dance is performed with brisk movement of hands and legs.